Above Average Below Special: Blog Tour: Dirty Little Secret by Jennifer Echols. 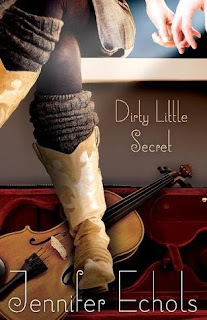 Blog Tour: Dirty Little Secret by Jennifer Echols. Bailey wasn’t always a wild child and the black sheep of her family. She used to play fiddle and tour the music circuit with her sister, Julie, who sang and played guitar. That ended when country music execs swooped in and signed Julie to a solo deal. Never mind that Julie and Bailey were a duet, or that Bailey was their songwriter. The music scouts wanted only Julie, and their parents were content to sit by and let her fulfil her dreams while Bailey’s were hushed away. I have wanted to read Jennifer Echols for years so I jumped at the chance to read her latest book! I loved the idea of Nashville and country music in a YA Contemporary. I've been catching up on Nashville so I definitely found it easy to picture the Nashville scene etc. It also took me awhile to twig Fiddle= Violin! Music- I loved the role music played in Dirty Little Secret. I loved the Mall impersonator circuit and how professional and talented they all were to be able to seamlessly play with different people everyday. I liked how the Nashville gig scene was portrayed, it felt very realistic and again full of talent! I loved the composition of Sam's band and how cleverly they blended different genres and eras of songs in their sets. I felt the role music had really made the book unique and stand out. Family- I could not believe how Bailey's family treated her. Her mother was overly ambitious and fame hungry her Dad weak and even Julie clearly had no real issue with leaving her sister in the dust weighed down by restrictions that weren't hers to pursue her own dreams. I'm so glad Jennifer Echols lived up to all the great things I'd heard about her. Dirty Little Secret was full of brilliantly crafted characters, with a vivid setting and an engaging plot! Which Jennifer Echols book should I try next? great review! love that part "what I loved"
I just finished this book last night after a single sitting. Boy does JE put you through the ringer! I can't wait to see what she comes up with next. Definitely going to read more of her books! Blog Tour: Again by Brandy Jeffus. New Adult Read-a-thon Wrap Up! Blog Tour: Three Daves by Nicki Elson. Behind the Cover~ Stripped by Brooklyn Skye. Once Upon a Read-a-Thon TBR. Cover Reveal: Lennon's Rain by Chris Myers.